Television guru Vladimir Pozner has apologized for calling the lower house a “state fool” after MPs threatened to draft a bill that would ban people with foreign citizenship from working for Russian federal TV channels. The veteran journalist and former president of the Russian Television Academy officially apologized in the Sunday broadcast of his show on Channel One television, about one month he called the State Duma a “state fool” – the expressions sound similar in Russian. The anchor said that what the parliament considered a deliberate insult was a slip of the tongue and he had already said sorry for it, but was ready to apologize again. However, Pozner emphasized that he was only referring to this one error. In reply to Pozner’s initial statement, four Russian MPs (representing the United Russia party, Liberal Democrats, Communists and a group of independent MPs who previously associated with the Fair Russia party) told the press that they intended to draft a bill that would forbid those who hold foreign citizenship to work on the state television channels. They also promised to name the bill after Pozner. In addition, the parliamentary anti-corruption committee officially requested that Channel One report on the salary paid to the anchorman. 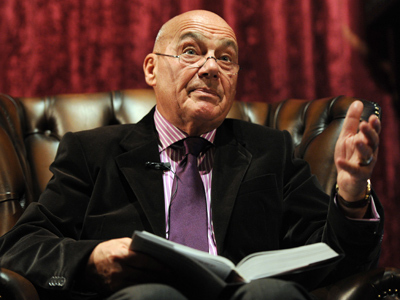 Vladimir Pozner is the son of a Russian immigrant and a French mother. He holds citizenships of Russia, France and the United States. He gained notoriety after hosting TV bridges with the United States together with Phil Donahue, and eventually headed the Russian Television Academy – the major NGO acting in the interests of TV producers and broadcasters and also handing out the most prestigious awards. In 2008, Pozner retired from the post of Academy president, but his influence in the industry is still great. The proposed ban caused wide resonance in the community, even though the parliamentarians have not produced even a project of the draft within a month since the start of the scandal. Pozner’s retraction apparently satisfied the authors of the initiative. One of the proponents of the foreigner ban, MP Mikhail Starshinov, told Interfax that the State Duma was ready to accept the contrition, but added that the Pozner Bill had been prepared and would be put on hold in case of possible incidents in the future. “We understand that the apologies by the anchorman were a forced step caused by persistent and strong measures taken by the State Duma,” Starshinov noted. Vedomosti daily quoted a source in the presidential administration as saying that the officials in the Kremlin did not like the idea of the Pozner Bill as it was dangerously close to introducing censorship in the mass media. However, the authorities wanted to remind reporters about their responsibility for public statements and therefore supported the bill’s authors. The source also said that to his awareness all MPs were satisfied with the compromise and will now cease to work on this issue. President Vladimir Putin’s press secretary Dmitry Peskov said in a press comment that the Kremlin considered the insults to the legislative branch power unacceptable, but also did not find it justifiable to affect the process of hiring anchors on television.